This multi-purpose, 4 valve manifold gauge set is perfect for maintaining R134a, R410a and R22 air conditioning systems. ●TEST R410, R22, R134A REFRIGERANT. Color coded hoses also help identify high side, low side and the filling hoses. 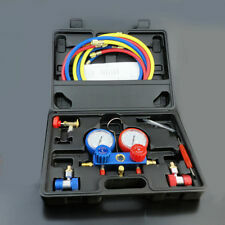 4 VALVE R134A R410A & R22 Manifold Gauges A/C Tester Freon gas Service Diagnostic AC W/ 4 HOSES. 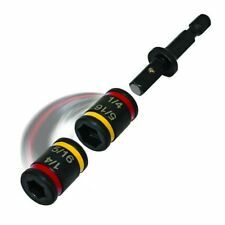 Works for R410, R22, R134a,R-404A. Flow Rate: 4.8 CFM. Each coupler have a shut off valve to prevent loss of refrigerant. Model: 69075. 1/4In female flare. LCD display. Ambient range 32 to120°F. our error. Item Specifics We apologize for this inconvenience. Doing that is against U.S. and international laws. 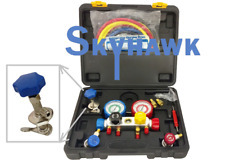 This AC Manifold Gauge Set is designed to test automotive air conditioning systems by comparing the "high side" and "low side" pressure reading to the vehicle manufacturer’s AC system specifications. Pre-owned, in good condition. Fully tested and works perfectly fine. Cosmetic dirt, scuffs, and scratches from prior use, including on the screen. Does not include instructions. Does not include a case. Free shipping within the US. Shipping is not free for international orders and will go through the Global Shipping Program. Each displays from atmosphere to 10 microns (bar graph indication above 25000 microns) of vacuum to let you know that your vacuum pump is clean and performing properly. Vacuum gauge (no sensor). Bearing, brush & motor inspection. (This is a Compact Subcool Superheat Calculator 5" x 2-3/4" x 1" thick. Enter refrigerant 2.). Enter pressure from gauges 3.). Clamp thermocouple on proper tube. Easily select superheat or subcool temperature with a touch of a button. 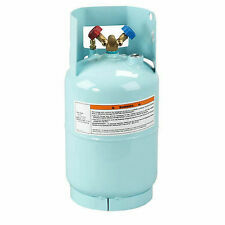 Approved for R410A refrigerant. Designed for standard 1/4" SAE refrigerant charging hoses. 1-Red: 1/4" Male SAE on one end and 5/16" Female SAE with valve core depressor on other end. 1-Blue: 1/4" Male SAE on one end and 5/16" Female SAE with valve core depressor on other end. 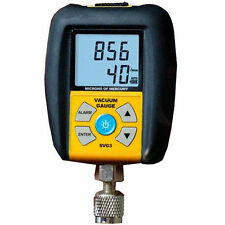 Fieldpiece SMAN3 3-Port Digital Manifold & Micron Gauge. Looks rough but seems to work (I know zero about HVAC tools). It has a broken screw hole on the battery cover and a couple black splotches on the screen (see pics). The spots don’t affect the read out. Has two clamps in good shape and no hoses. What you see is what you get. Cheapest price on eBay due to cosmetic condition. Bid confidently because we have 100% positive feedback! Thanks!Condition is Used. Shipped with USPS Priority Mail. Refrigerant R410a A/C Straight Ball Valves. Suitable For A/C Charging Hoses HVAC 1/4" AC Refrigerant R410a Freon. Valves are designed for standard 1/4" SAE Refrigerant Charging hoses. Using Shut off ball valves reduces the lose of refrigerant. The only gaskets designed for optimum performance with YELLOW JACKET Charging Hoses. Manufactured to strict tolerances to resist blow out. Nylog Blue is a elastic fluid made from synthetic refrigeration grade compressor oil. Nylog Blue is fully miscible and compatible with all system refrigerants and oils. Threaded connections coated with Nylog will block high pressure leaks by forming a hydraulic seal. VARIAN 810 MILLITORR TC VACUUM GAUGE MR2-1305 / THERMOCOUPLE VACUUM GAUGE, NOS! The App can also be used to download new refrigerants from the Internet directly into the manifold. to two external temperature probes. 2 x Clamp Probes. 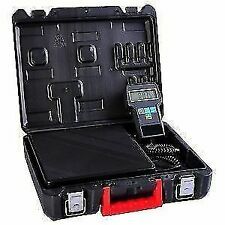 -The Tester is thus excellently suitable for commissioning, service and maintenance. Ultrasonic sound occur when the atmosphere leaks into a vacuum vessel or when a pressure vessel leaks to the outside atmosphere. Ultrasonic sound's frequency is related to the size of the orifice which ultrasonic sound passes through, but usually the frequency is about 40kHz. SNAP ON R12/R134A AC MANIFOLD GAUGE SET #ACTR4151A (LIGHTLY USED). Condition is Manufacturer refurbished. Shipped with USPS Priority Mail Medium Flat Rate Box. Here is a set of used but in good condition refrigerant hoses. $(6) 1/4" Hose Gaskets & (6) Valve Core Depressors These are the Valve core depressors used on the 1/4 female flare gauge set hoses. 1/4" Replacement Valve Core Depressors Use plenty of vacuum pump or mineral oil when installing these! You will get 6 1/4 Hose gaskets & 6 valve core depressors. Gasket Size Approx. O.D.= 5/16" Approx. I.D,= 3/16" Installation Instructions Remove exsisting valve core depressor and hsoe gasket. Clean insert with Q-tip and the lubricate lightly with vacuum pump oil. First insert new black rubber gasket, then screw in (using a valve core tool) new brass depressor. Do not screw depressor all the way in. It must be slightly above the gasket end so it can depress the valve core when you screw it onto the hose fitting for the system!. Copper tubing flaring tool copper tubing swaging kit in a combination tubing flaring. /swaging kit to fit all your needs. 5 Swage Adapters For: 3-in-1 (3/16",1/4",3/8") ,5/16",1/2",5/8"& 3/4" O.D.Tubing. Testo 570 0563.5703 Refrigeration System Analyzer w/ Vacuum & Datalogging. 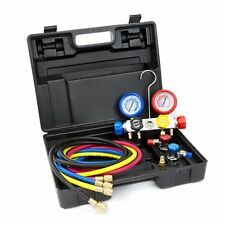 You are Looking at a Brand new Tool kit: Manifold Gauge Set, Model: GMad with aluminum alloy body 5-ft colored refrigeration Hoses; Car AC System Port Quick Snap on Couplers/Adapters/ Connectors, Model QCPL; And R134a Can Tap/Tapper/Opener 1/4" Flair Fittings Model TAP1, Work on Home/Office AC and Car AC Systems Alike, Complete for the Job. Reotemp LL0601F43 Temperature Gauge 0-200F 3" Dial 6" Angle Stem ! WOW ! Heat, ventilation, and air conditioning (HVAC) systems are designed to provide and maintain clean and comfortable air in the indoor environment. The HVAC systems can be operated by professional technicians or just regular homeowners. This guide will help you understand the tools required for heat, ventilation, and air conditioning. What are the measuring tools required for HVAC systems? Thermometer: Thermometers are made using different technologies. You can consider these specs when choosing thermometers. The technologies used include thermocouples, thermistors, and infrared beams. 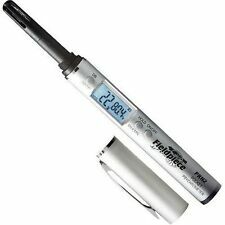 Some thermometers are designed to give two readings at the same time, and others have built-in flashlights to be used in dark places. Other thermometers give their interpretations simultaneously, and this is essential if your environment temperature keeps changing. Leak detectors: These are also very important HVAC tools. They will alert you if there are any harmful gases or radiation in the indoor environment. These tools will help you point out the origin of the leaks. There are different types of leak locators, and each is made to detect specific leaks. Combustion analyzers: These tools help to ensure the proper functioning of the units that generate heat after combustion. They work by measuring the temperature of the smoke in the fuels and the level of oxygen and carbon dioxide in the air. Anemometer: These HVAC tools work by measuring the exchange of air throughout the system. Its purpose is to check that the room is maintained at the right temperature. 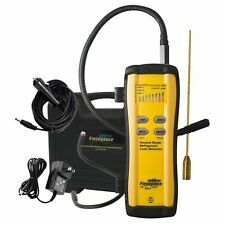 How do you choose a leak detector? Halide torch: This is a propane torch with a specific tip that is attached to a canister. It is used to detect refrigerant leaks because it has halogen gases in them. They are used to identify the leaks based on the colour of the flame they produce while combusting. Fluorescent dye: These dyes come with dye injectors, dyes, UV protection glasses, and UV light. In order to inspect a leak, the refrigerant has to be injected into the system. Then, the UV light is used to check the areas where the leak is suspected to be coming from. Electronic: These ones are used to sense the presence of any molecules of the refrigerant in the air. They have an alarm that goes off when molecules are detected. 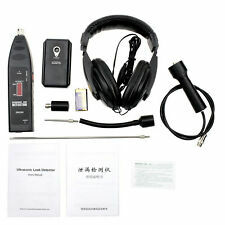 There are different models of the electronic leak inspectors. They include heat diode inspectors, corona-suppression, infrared, and ultrasonic refrigerant inspectors. 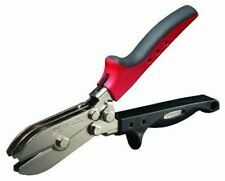 What are other basic tools an HVAC technician uses?